It looks so simple... and that deception isn't an accident. Since the conception of Points, the goal has been to make it look as one would expect a directional sign should. Packing motors, gears, sensors, wiring, and a support structure into such a compact package, however, was far from an easy feat. Over the past three years, we designed and prototyped countless ways to bring this idea to life. Below is a look into some of what made Points possible. 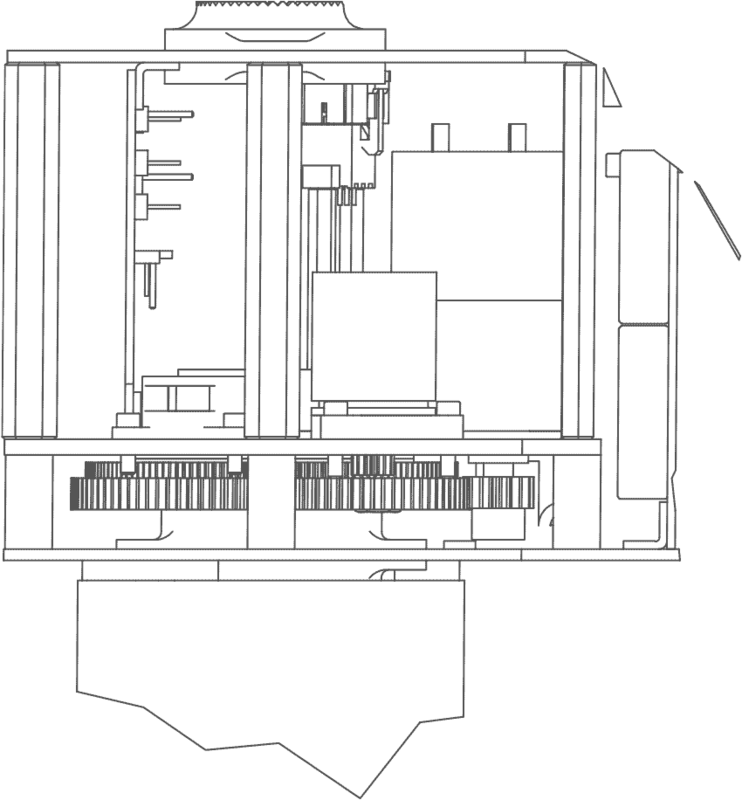 Points features rotary electrical interfaces which allow the arms to endlessly spin 360° in either direction, removing the issue of tangled wires. While this solves one problem, it creates another: knowing the exact position of each arm at all times. To accomplish this, Points utilizes a 200 pulse per rotation quadrature encoder, allowing it to know its exact rotational degree at any given point. It also features a magnetometer and touchless magnetic switches that assist in always keeping it pointed in the right direction. Controlling the 16,000 LEDs which make up the arm displays takes some hearty processing power. The latest XMega chips provide blazing data performance while keeping the interior temperature cool and the power drain at a minimum. The motor design and gearing rig were our greatest challenges. While each arm was designed using the most weight-efficient materials, a motor strong enough to spin it would be almost twice as large as the space available inside the arm. It took a custom built system using over 11 gears and specialized motors to achieve the strong, reliable, and smooth motion achieved in the final product. The super-bright LEDs panels that make up each arm's display were custom designed to look beautiful, be highly reliable, and perform in a wide range of environmental conditions. Their wide viewing angle allow the displays to be easily readable from any direction, while Pulse Width Modulation achieves the greatest brightness and the ability to handle complex fading. Designing a large device like Points to be durable while also being able to break for transportation made for some hurdles. We chose to build 90% of all mechanical parts from lightweight aluminium. This provides Points with the strength and durability to live in an array of different environments; while keeping it lightweight and efficient for transport as well as functionality. Every part of Points has been designed and fabricated from the ground up. In collaboration with Blacklabel Development, we built incredible circuitry that delivers great performance while conforming to the size requirements of the design. The LED arrays, in particular, go well beyond standard practices, allowing a new level of what can be achieved from this type of display. By leveraging social and brand data, Points can serve up brand relevant content and bridge a physical store or event back to what's happening around the web. By leveraging real-time APIs, Points can serve up where transportation can be found and when the next bus/train/plane/car will be departing or arriving. Provide attendees with an easy way to find talks, events, and local destinations. 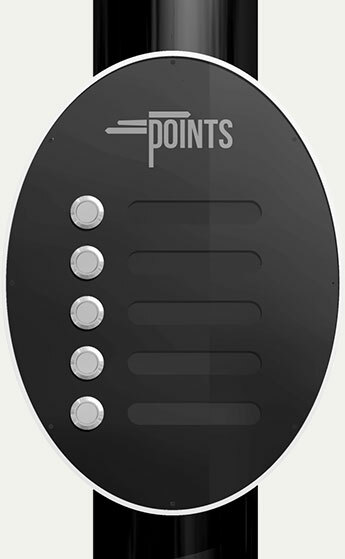 Points helps direct people to a conference room down the hall; or a BBQ restaurant across town. It also drives people towards events just as they are about to begin. Conference rooms, talk times, stages, and any other custom event locations can easily be served up, allowing Points to direct attendees to where the next best thing is going to happen. Local restaurants, stores, events, etc. are pulled in via local data APIs, allowing Points to serve up the nearest and best places for that time of day. It additionaly pulls info such as open/close times and daily specials. Points is designed to be extended via custom data or APIs so that it can dispense data and information that’s relevant and needed for a particular event. We're currently only speaking with those interested in licensing the tech behind Points, or those interested looking to become a manufacturing partner. Interested in licensing the tech? Thank you for submitting your rental request. Thank you for reaching out. We'll keep you updated with any new information as our development moves forward. Sign up below to be added to our mailing list (once a month at the most) about where we are in our manufacturing and delivery status. An email has been sent for you to confirm your details. InstaprintThe location-based photo-booth for Instagram. Electromagnet Reactive Dot ScreenA physical display like you’ve never seen. From transit to sports to promotions. Connecting events with real-time data. 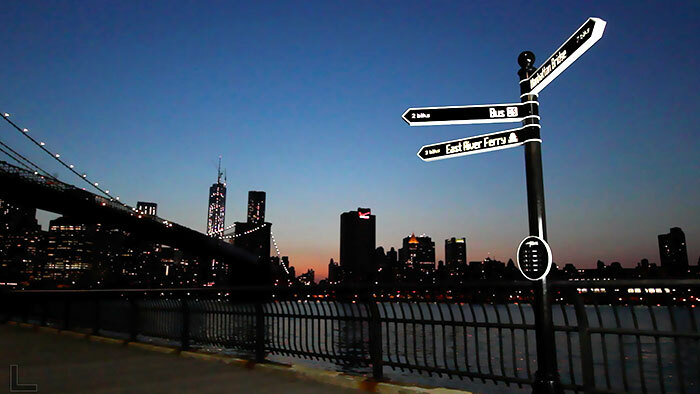 This live footage of Points, shot in Brooklyn, shows off an early version of Points Smart Sign in action. Looking for the live stream testing? It's currently off-air in order to continue development. View previously recorded footage here. Points features a menu which updates as everything around it does. As more appropriate, popular, or timely events approach, the menu refreshes its options.